The Department of Labor recovered $1.6 billion in 2018. There were 1329 civil investigations, 64% of which resulted in a monetary recovery or corrective action. 111 of these went into litigation. There were also 268 criminal investigations. Attorney Carol Buckmann recommends regular self-audit and use of self-correction program. DALBAR's Certification of Reasonableness reports identify issues before they become a DoL statistic. 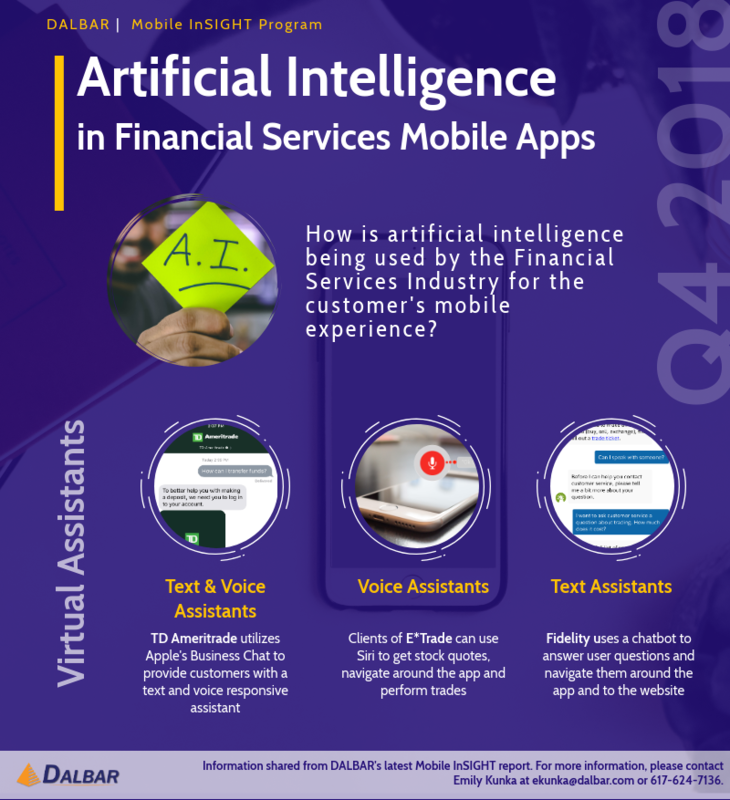 How is AI being used for mobile in Financial Services? Check out our latest Mobile InSIGHT report to learn more! Lou Harvey is The Big Interview on Money Life with Chuck Jaffe! Listen now. Interesting article from the Daily Republic in California mentions QAIB Study, "Wealth Matters: Stock market ‘guru’ same as ‘charlatan’"
Marketwatch opinion article, "Investors’ widely-held beliefs about ETFs and index funds may be wrong" uses DALBAR's latest QAIB findings as support for investor behavior. Transamerica’s retirement website has a fresh new look and feel that is easier to navigate. Most links are now housed in the main navigation menu and the color palette has been updated to provide a more clean layout. Fidelity Investments' clients are being offered a Web browsing experience in Virtual Reality to monitor their portfolio. Data visualization tools and collaboration capabilities avail customers of a fully immersive experience in which to view their investments solo, or with a family member or financial advisor. Is The Index Bubble About To Burst? Index investing is no protection from reality. QAIB shows that “Reality” can cost 1/3 of your gains! Fidelity faces 3 separate challenges of its “infrastructure fee.” DALBAR’s Lou Harvey weighs in on the topic of fee reasonableness,arguing that the consideration of fee reasonableness must take place in the context of value. Using the Gartenberg standard for reasonableness, the “infrastructure fee” passes muster and Fidelity should easily prevail on all 3 fronts. John Rekenthaler (Morningstar) discusses the rise and fall of investment expenses. He makes the point that, after considering all services, there is no free lunch. Equally important is the fact that comparing specific fees across multiple companies is a fool’s errand since there is no alignment of which services are free and while other services are funding the free ones! This is likely to get even more confusing in the future, leaving the “all-in” cost as the only reliable measure of investment expenses. The fiduciary standard continues to get muddled by the SEC. Does disclosure cure a breach of fiduciary duty? The answer should be “no” but as one fiduciary advocate points out; the SEC seems to be sending a different signal. Broker/dealers settled with the SEC for $125M in investor restitution for failing to disclose to investors that they were being sold more expensive shares that contained 12b-1 fees when less expensive share classes were available. New York Life recently streamlined their homepage to reflect a more simple and user friendly experience. The updates are most noticeable through images highlighting the features that would be of most interest to the end user in a sleek and attractive "less is more" manner. For the first time in the 10 years we have been tracking representative tenure, negative attrition (leaving the company) has exceeded positive attrition (moving internally) for contact center representatives, threatening the well-established personnel feeder system and driving down training ROI. Today is the last chance to pre-order DALBAR's Financial Services Contact Center Trends and Best Practices report to learn more about this and other trends impacting the industry. The work-at-home trend continues, with more than 1 in 3 financial services companies now allowing contact center representatives to work remotely. Learn more about this and other changes in the financial services contact center landscape with DALBAR’s Financial Services Contact Center Trends and Best Practices report. Gartenberg wins again, in biggest mutual fund case ever! The court applied the Gartenberg standard in rejecting the excessive fee claim against Blackrock. The plaintiffs claimed their fees were excessive since Blackrock charged lower fees to its subadvisory clients. The court agreed with Blackrock that this practice was legitimate if it complied with Gartenberg. DALBAR is pleased to award HSBC InvestDirect the 2018 Telephone Service Seal of Excellence. DALBAR study shows older women defy age and gender stereotypes when it comes to using technology to manage finances with paperless statements.When it comes to using paperless statements to manage finances, it turns out that older women are more tech savvy than many would think. DALBAR is honored to be recognized for our awards by customer communications manager OpenText Exstream, calling them "the 'Oscars' of the Financial Services industry. Website visitors to Penn Mutual’s site will notice a sleek update to the homepage improving upon the clarity and making it easier to maneuver. The most noticeable update includes limiting the number of drop down menus within the navigation bar ensuring that each is highly relevant to the user. A shift toward promoting more visually appealing articles are a welcome improvement as well. 62% of firms promote e-delivery on account statements, but 74% of the industry feels it has “little effect” on increasing enrollment. So why use it? Because when it’s done right it can push the needle on e-delivery adoption. DALBAR’s 21st Annual Trends & Best Practices in Investor Statements examines the prevalence and usefulness of e-delivery statement messaging and recognizes the leading statements and best practices in Brokerage, Mutual Fund, Defined Contribution and Variable Annuity. Edward Jones reports that it added over 1,500 advisors in 2018, making it the largest brokerage firm in the nation in terms of number of advisors. Congratulations to an excellent firm with a second to none culture. NAPA’s Nevin Adams points out an eye opening comment from 1st circuit Judge in Putnam vs. Brotherston: “…any fiduciary of a plan such as the Plan in this case can easily insulate itself [from liability] by selecting well-established, low-fee and diversified market index funds.” Mr. Adams asks if this is suggesting that a lineup of index funds brings about a presumption of prudence. Good question! DALBAR Canada is pleased to announce that the following firms have recently earned DALBAR’s 2018 Telephone Service Seal of Excellence. The case of Putnam vs. Brotherston could magnify the fiduciary risks of those who act on behalf of retirement plans and/or investment managers. If heard by the US Supreme Court (and I expect it will) the result could mean that any investor loss could be followed by an avalanche of lawsuits that require fiduciaries to prove a negative… they did not breach their fiduciary duty! In other words, fiduciaries would be guilty of a breach unless they can be shown to be innocent! On the other hand, the court could make it clear that fiduciaries are innocent until they are proven guilty. The burden of proof would lie with the party with the loss. Nevada is the latest state to take fiduciary matters into its own hands. The proposed regulation imposes a fiduciary duty on broker-dealers and sales representatives. 2019 kicks off with a huge strategic alliance between RBC Global Asset Management and BlackRock Asset Management Canada Ltd. Two leaders under one RBC iShares brand is a win-win for all. The $60 Billion combined suite offering becomes the largest, most comprehensive ETF offering in Canada. This could be the best executed strategic alliance of the year! Hartford Funds is calling 2019 the year of the participant, advocating a measurement of retirement plan success, not effort. Measuring retirement plan success is the cornerstone of DALBAR’s plan analysis. For an independent measure of plan success, just ask DALBAR. Lesson to be learned from the District Court’s dismissal of the ERISA complaint against Georgetown University – look carefully at the harm actually suffered by the class representatives. Representatives of a class action must have actually been injured for the class to have constitutional standing to sue. So if the complaint alleges poor performing funds, the representative plaintiff must have actually lost money in those funds. If the complaint alleges unreasonably high withdrawal penalties, the plaintiff must have actually incurred the penalty. Congratulations to Putnam Investments who has earned the Total Client Experience Award for consistently delivering an exceptional all-around contact center experience to mutual fund shareholders. Having low fees or impressive performance won’t get you hired. However, having high fees or poor performance will get you fired. According to Ignites Research, only 8% of clients chose their advisor based on fees, and only 15% of clients chose their advisor based on performance. But the story doesn't end there, 50% of clients who closed their account did so at least partially due to fees, and 47% closed their account at least partially due to performance. Investors have been experiencing a shock as of late, going from the calm markets of the past few years to a volatile, gut-wrenching test of nerves. The Average Investor has held its own during these calm years but will need coaching more than ever to overcome the psychological challenges that could wait ahead. Canadian mortgage expert anticipates the decline of in-branch mortgage sales as lenders lower their costs by cutting out the middlemen (a.k.a. “mortgage specialists”) and replacing call-centre reps (often no more than lightly trained customer-service agents) with salaried mortgage experts and chat bots. The Supreme Court may soon decide if an agreement to arbitrate all claims that an employee may have against their employer includes a breach-of-fiduciary-duty claim under ERISA § 502(a)(2). The 9th Circuit ruled that such an arbitration agreement does not apply because the action is on behalf of the plan, not the individual. If SCOTUS disagrees, will it eviscerate participants' right of action under ERISA? John Hancock has recently made changes to the log-in process for plan sponsors that improves security while making the process easier. A verification passcode is no longer necessary, but rather secondary security checks will be completed using authentication protocols. In the event those protocols are not successful, the system will revert back to the original method utilizing the verification code - a definite improvement to the sponsor experience. DALBAR Announces the 2018 Best-in-Class Annuity Service Providers. In the "Age of the Customer" see who the leading providers are that consistently deliver best-in-class telephone service experiences to today's demanding consumers. Capital preservation will be in the spotlight when the market turns over, putting pressure on passive investments. ERISA litigation specialist calls for plan sponsors to look deeper than the superficial argument on costs, saying it’s hard to believe there is no place for active management in a retirement portfolio. ERISA litigation is not going away but a documented, prudent process will help protect plan fiduciaries from liability. Read this article from Cohen & Buckmann, P.C.. Experienced investors prefer active investing using individual stocks over using an ETF strategy according to a recent E*TRADE survey. Individual stocks are the investment vehicle of choice as they allow investors exposure to specific sectors while ETFs generally do not. While the preference for investing in individual stocks has declined over the past few years, it still remains stronger than a preference for investing in ETFs. A survey from Empower shows that 66% of small business owners are in favor of open MEPs. Much work is still to be done by Congress to make open MEPs a reality. Read how to make MEPs attractive to small businesses. The most important measurement of retirement plan success is the income it will replace. Sadly, according to PSCA only 31% of retirement plans measure their success by this metric. DALBAR’s Certification of Reasonableness uses income replacement as one of many metrics to measure plan success. That plan success is directly tied to the reasonableness of fees. Like Apple, TD Bank is getting into the wallet game too. This is merely the beginning of making your physical wallet disappear. Banks are transforming into tech companies in many ways. DALBAR recognizes those providers which stand out amongst their peers in the quality of telephone service and support being delivered post-sale to financial professionals with the Financial Intermediary Service Award. Every broker/dealer and registered rep should read the Report on FINRA Examination Findings. Suitability continues to be an area of deficiency. With changes on the horizon (Regulation BI), brokers should take steps now to ensure their house is in order. Principal is seeking to maximize the efficiency of plan administrators via its upcoming chat option to allow sponsors to get immediate answers to their questions. The firm offers a sneak peek of what the feature will look like to build anticipation about the new functionality. Forbes highlights the new era of CX in this article with statistics from a Gartner survey. Many companies are looking to compete in 2019, how about yours? Canadian banks miss opportunities with mass affluent Newcomers to Canada. The needle hasn’t moved very much from the last time the study was undertaken in 2014. The 2018 study confirms that the banking needs of mass affluent Newcomers are often overlooked. CNBC Commentary talks investor behavior mentioning DALBAR's QAIB, "Take these steps to control your (over)reaction in the face of market volatility"
Supreme Court could open floodgates for excessive fee lawsuits if it takes up the case of Brotherston v. Putnam Investments. Putnam is expected to ask the Court to decide whether the plaintiff (Brotherston) or the defendant (Putnam) has the burden of proof of fiduciary breach after the plaintiff suffers a loss. Should the Court decide that the defendant must prove that it acted prudently, one can expect thousands of cases to be filed after every severe market decline. On the other hand, if the plaintiff must show the proof, the cost of establishing this proof will be so high that this type of litigation will be impractical. John Hancock Retirement Plan Services (JHRPS) is putting “participants first” by offering a Cybersecurity Guarantee to repay qualified participants for unauthorized transfers from 401(k) retirement accounts. A newly redesigned website for The Guardian Life Insurance Company of America offers visitors a better overall experience including a new Insights &Resources tab on the main menu in addition to the pre-existing options. Guardian has also beefed up the site with extras such as a short video with more of a personal angle on the home page and an easy way for visitors to find a financial professional. October 17, 2018 marks the first day of Marijuana Legalization in Canada. It took 95 years to reach this historic day and finally companies can now chase the Green Rush. Other first world economies eagerly awaits the net effects of this multibillion dollar industry. In April of 2016, cyber villains impersonating Voya Financial Advisors, Inc. contractor representatives called the technical support line and requested a reset of 3 representatives’ passwords. The cyber villains used the usernames and passwords they obtained to gain access to PII for at least 5,600 of customers. In two instances the phone numbers used had previously been flagged for similar fraudulent activity! Learn more about authentication practices in the Financial Services Industry here to better protect your firm and your clients. Why not offer a sidecar plan? Employee contributions and matches fund these plans until saving for emergencies are covered then contributions are automatically flipped into a retirement plan! These taxable savings accounts provide a cushion for unexpected expenses -without taking loans or withdrawals from the 401(k). The most unlikely state has taken the lead on establishing a fiduciary standard. New Jersey plans to be the first to require a fiduciary standard for all advisors doing business there. NJ has rejected the SEC best interest regulation as being inadequate. The fiduciary bell cannot now be “un-rung”! To the Fiduciaries Go the Spoils. Blake Goldring, one of Canada's most well known CEOs in the mutual fund business hands over the reins to Kevin McCreadie, AGF's current President & CIO. Founded in 1957, AGF played a key role in launching the mutual fund business in Canada. Traditional mutual fund businesses are seeking a renewal of leadership for future growth. The on-boarding process for the AGF's new CEO took 4 years. The Family Savings Act of 2018 is expected to be voted on in the House this week. The bill would among other things help to open Multiple Employer Plans, increase portability of lifetime income investments, and make some significant changes to RMD rules. New York University seeks to punish the law firm (Schlichter Bogard & Denton) and the plan participants for “filing a duplicative (now a dismissed) lawsuit which Plaintiffs and their counsel filed in a blatant attempt to avoid the Court’s prior rulings,”. The original case was one of several excessive fee suits filed against university 403(b) plans. In the NYU case, the plaintiffs alleged losses of more than $358 million. A grocery chain’s credit card outperforms credit cards offered by Canadian banks. Loblaw Cos.’s President’s Choice Financial credit cards rank No. 1 for customer satisfaction, beating out cards issued by the Canada’s biggest banks, according to a study published Monday by J.D. Power. Testimonials are great, but if you’re an RIA it could cost you BIG. The SEC recently fined an RIA $250,000 for violations of the Testimonial Rule. Get the benefit of a testimonial without the quarter million dollar fine. Learn more about DALBAR’s No Action Letter and Client Ratings. Bloomberg published an in-depth fee discussion “Unpacking the Bundle--Prudent Practices for Assessing Bundled Services in This Era of 401(k) Plan Fee Litigation”. The author makes the point that bundled fees cannot be compared using simple metrics. This concurs with the DALBAR finding that a reasonable plan fee in a $100M plan can vary from 32 to 176 basis points, based on the specific quality and nature of services. See DALBAR analysis of “Minimum and Maximum Plan Fees”. Focused on simplicity and functionality, Vanguard recently unveiled an attractive new shareholder portal page. The oath of investor loyalty is highlighted front and center and pop-up features help visitors maneuver around the site with ease. Clean, minimalistic icons subtly draw visitors' eyes to available page options. Pacific Life’s new user-centric website focuses on helping clients achieve their financial “life goals”. Designed to better connect with clients through its super relevant offerings, the site features customer stories, financial calculators and customer-friendly product categories. An estimated read-time on informational articles further underscores the firm’s commitment to supporting visitors’ use of the site. Wealth manager, John Napolitano uses DALBAR’s investor returns study to explain why investors need more than the high efficiency, low cost robo. The robo does not ask you “why”. DALBAR President and CEO, Lou Harvey spoke with BenefitsPro about Open MEPs and how to make them appealing to small businesses. Fidelity Investments introduced a new advice solution Fidelity Personalized Planning and Advice for plan participants at any company that offers a Fidelity workplace savings plan. The innovation is available at no additional cost and is a tool that will allow participants to create a customized financial plan focused on long-term investment goals. Expert advice is available through Fidelity and the plan will evolve as the participant's needs change. President is expected to announce today a release of Multiemployer Plan restrictions, giving millions of small business employees access to retirement plans. TPAs will be in the best position to facilitate what will become an industry transformation. The use of remote representatives has been among the biggest changes in financial services contact centers in recent years. While the number of firms allowing reps to work remotely remained flat from 2014 to 2016, the number of reps at those firms taking advantage of the opportunity skyrocketed, going from 13.7% in 2014 to 49.1% in 2016! Stay tuned for DALBAR's 2018 Trends & Best Practices in Financial Services Contact Centers to find out where things stand today. SEC orders Aegon to pay $97M. Technology can help mitigate risk, but if not applied properly it is no help. Having investment models vetted by an independent 3rd party helps to ensure models are functioning as intended and in accordance with generally accepted investment principles. This mistake cost Merrill Lynch $9 Million. DoL is still on the hunt for traditional fiduciary breaches. While the no-enforcement policy died with the new fiduciary rule, old enforcement measures are very much active. The focus is on conflicted compensation among fiduciary service providers [such as 3(38’s and 3(21’s)] and asset managers. AI in financial service will certainly need expert certification to address the compliance issues. The framework exists in retirement plans [408(g)] but wealth management is uncharted and complex. The current bull market may go down in history as the longest. Since March 2009, the Dow Jones Industrial Average has already risen 286%, the S&P 500 advanced 320% and the Nasdaq has soared 521%. Huge contributors of the bull run are the FAANG stocks (Facebook, Apple, Amazon, Netflix, Google)…time will tell how much fuel is left in the tank for this bull run. We are excited to announce that the submission window is now open to be included in this year’s Trends & Best Practices in Investor Statements report and ranking! Statements and client reporting submissions will be accepted through September 30th. The report will be published in January 2019. Please reach out to bhalloran@dalbar.com with any questions. The SEC's proposed Regulation Best Interest seeks to impose a duty on brokers to mitigate certain conflicts of interest. This series of articles will explore the various ways firms can effectively mitigate or eliminate conflicts of interest. Check out our new e-Delivery Insights & Resources page to stay in the know when it comes to electronic delivery. Don’t forget to sign up for the complimentary quarterly e-Delivery newsletter! Register for a complimentary webinar on Tuesday 8/14 from 2-2:30 pm ET in which we will share highlights from the 20th Annual Trends & Best Practices in Investor Statements report and let you know how to make sure you are included in our upcoming 21st annual report. The trend of favorable judgements continues, 7 cases reported here in the last month! Wells Fargo wins a second judgement in the case that charged a fiduciary breach connected to use of proprietary target date funds in its 401(k) plan. Print & Paper industries go after SEC for e-Delivery as a default. The Coalition for Paper Options have joined Consumer Action, the American Forest & Paper Association, the Printing Industries Alliance and Twin Rivers Paper Company in filing a federal petition to stop Rule 30e-3, adopted June 4 by the SEC to switch the default distribution method for annual and semi-annual mutual fund performance reports from mail to e-Delivery. Great American Life recently unveiled a newly redesigned RIA website highlighting features such as educational articles, advice for the independent advisor and white papers. Multiple portfolio simulator tools were also introduced including one that generates a side-by-side comparison of a given portfolio with and without a fee-based product. Cracks are clearly emerging across the global housing markets. Stringent lending rules, tax changes, and affordability concerns are all contributing to the downward pressure on global property prices. From Sidney to Toronto, Beijing to New York, homeowners and property investors are hitting the pause button. Proof is in the data. This month’s WebMonitor Newsletter highlights a refresh to the John Hancock Investments website. The site has been enhanced with design and navigation improvements focused on readability, user customization and directing users’ attention towards John Hancock’s investment products. Investors waiting for a bitcoin ETF will have to keep waiting. SEC rejected Bats BZX Exchange, Inc.'s petition for review to list and trade shares of a bitcoin ETF. Commission stated that bitcoin-related markets are in early stages and can't adequately address the risk of fraud and manipulation. This may change as bitcoin-related markets develop in the future. Pacific Life launches a new redesigned consumer website available across all digital and mobile platforms that focuses on guiding and educating in order to help achieve one's "life goals". Yet again Customer Experience (CX) was rated as the most exciting business opportunity for companies in the coming year – Here is a list of 7 ways to create an effective CX strategy. The one critical element missing from this list – Measurement. Gartenberg Rule prevails again! Blackrock wins a favorable summary judgement in an excessive fee case based on the Gartenberg Rule. This is the latest of losses for plaintiffs in excessive fee cases. These include cases against Edison (Hewitt), Checksmart (Cetera), AT&T (Fidelity) and Wells Fargo. Could this be a trend? Announcing the redesign of the new Registered Fiduciary (RFTM) Certification website where financial professionals are explicitly identified for their commitment to act in a fiduciary capacity. Recognizing that the customer experience (CX) is critical to long-term success in today’s economy; more and more companies are expanding their C-Suite to include a Chief Experience Office (CXO). Here are some of the top attributes necessary for succeeding in that role. Here is how advisors can take advantage of the chaos left by the demise of the DoL Rule. Smart advisors will use the promised standard of care to attract new clients and provide the level of service the DoL Rule required. A small 401(k) plan wins in court. Checksmart/Cetera, the first small plan and advisor arrangement to face excessive fee 401(k) litigation wins dismissal after two years. The U.S. District Court for the Southern District of Ohio found that the ERISA three year limitation on bringing such actions had expired when the claim was made. This case will undoubtedly discourage thousands of potential cases against small plans that have had excessive fees in the past. Check out our new blog post! "The Case for Plan Sponsors to Support Participant's Financial Health"
Forrester predicts that 30% of companies will see Customer Experience declines in 2018, leading to a loss of growth. No need to worry, DALBAR is here to help you keep your CX on point. America's wealthy are moving to cash as market enthusiasm hits a wall. Is this the best indication of a rising equity market for second half of 2018? History indicates that investors guess wrong most often in volatile markets! The Quantitative Analysis of Investor Behavior (QAIB) found that investors act on their concerns before strong equity markets. Hackers are moving past data to real money. The concern that protecting data is insufficient and authentication must protect the underlying funds is now a proven reality. While focus on data remains an important consideration, it is the access to funds that needs better protection. Court rejects $1 million payment to Schlichter Bogard & Denton after they won the excessive fee suit against Edison for 401(k) plan. This blow may take the wind out of the sails of the law firm that is behind so many ERISA excessive fee cases. As part of a rebranding effort, Securian launched a clean, contemporary redesigned website that places a greater focus on customers. A bright color scheme with warm family photos as well as a new logo representing “the family circle” is presented. A video is offered explaining the new visual direction for Securian. The Supreme Court has ruled that the use of Administrative Law Judges (ALJs) that preside over SEC cases is unconstitutional. The Court found that the ALJs do not undergo the appointment and confirmation process that the constitution requires. Presumably then, gathering evidence, issuing subpoenas, examining witnesses, and imposing sanctions they have ordered are nullified. ALJs are the principal enforcement tool of the SEC so this is a crippling blow to the agency’s enforcement. Symetra’s updated corporate site has improved navigation and a super inviting look and feel. Mega menus and large menu blocks offer seamless navigation and immediate orientation to the site’s offerings. Though both old and new sites appropriately placed emphasis on life-stage events, the combination of a natural yet bold color scheme, friendly graphics and impactful placement provide a clear positioning of Symetra’s offering as well as a very pleasing user experience. E*TRADE has expanded its mobile tool suite to include real-time market scanning to mobile devices with their LiveAction Mobile Scanner. On-the-go advanced market scanning tools are now available to traders including: 24 unusual activity scanners and 43 volatility scanners to live-stream the market. The ability to save favorite scanners is also available. (An excerpt from the WebMonitor Site Watch newsletter). Could we actually begin educating kids for jobs? The contemplated merger of Education and Labor Departments would mean upheaval but it could also mean that 401(k) education could be taught in schools… I wish! The race to the bottom continues, will quality follow? Declining mutual fund costs in 401(k) plans will lower benchmarks, putting plan sponsors at risk. Rather than chasing a shrinking benchmark, plan sponsors should place an economic value on plan services to draw their own line in the sand. Despite solid investment returns in the past couple of years, only 55% of High Net Worth individuals connect strongly with their wealth manager according to the 2018 World Wealth Report, a leading benchmark that tracks the wealth of High Net Worth individuals and the global and economic conditions that drive change in the Wealth Management industry. Nationwide touts their multiple DALBAR Plan Participant Service Award wins in a new video highlighting many of the great things they are doing with their Retirement business. New! Mobile InSIGHT Report: Innovations in the World of Mobile Optimized Web Sites. Ask us about our mobile seal award! Microsoft study supports DALBAR findings: most US consumers consider service quality to be “very important”, service expectations continue to rise, and a majority of customers switched brands due to a poor service experience. L.A. Times rates investor behavior and discipline as the #1 factor to help or hurt a portfolio’s return. Cites DALBAR’s Quantitative Analysis of Investor Behavior (“QAIB”) study. AARP testifies at the SEC’s Investment Advisory Committee, calling for improvements to the proposed Customer Relationship Summary Form. Asking for client referrals can be difficult, and in some cases puts the client in a tough spot. Understanding what's allowed under the SEC testimonial rule allows advisors to let their clients' collective voice be heard. 38 States now permit e-delivery of insurance documents. Expect all states to be on board within a year. Fidelity’s Founders Class, an opportunity to invest in visionaries has raised $65M in the Canadian marketplace in less than 2 short months. The formula is simple…invest in leaders who are innovative, client obsessed, and have skin in the game. Financial professionals use investor behavior study to underscore the virtue of patience and avoid investors' temptation to time the market. First impressions count! DALBAR took a look at the State of the Industry with respect to Online Enrollment processes for Defined Contribution plans. SEC normalizes e-Delivery with two year window to comply. e-Delivery will become the default for regulatory documents in January 2021. Investors must be notified beforehand in prospectuses, annual and semiannual reports. Check out the latest e-Delivery benchmarks for an update of today’s best practices. What is a 408(g) Advisor? Five Firms Earn High Honors in Dalbar’s Analysis of Performance Reports – Congrats to #1 @MerrillLynch! One financial professional indicted ($11M), and one arrested ($8M) in New York in the last week. Both targeted elders. The rise in financial exploitation of elders underscores the need for Registered Fiduciaries (RF™), who are thoroughly vetted professionals. Simplii Financial, a direct banking brand within the Canadian Imperial Bank of Commerce (CIBC), and Bank of Montreal (BMO) both announced on Monday possible security breaches. Fraudsters contacted both firms claiming that they were in possession of certain personal and financial information from the firms' client base. A recent report by DALBAR on Authentication practices discusses key methods used to prevent disintermediation of financial assets by theft or disruption by cyber-villains who have already acquired the data necessary to threaten disintermediation. InvestEdge, the leading provider of innovative financial advisory solutions, today announced it has been awarded the prestigious DALBAR Communications Seal of Excellence for Performance Reporting. TIAA and Northwestern University vindicated in excessive fee lawsuit. Second such suit that failed in court. University of Chicago to pay $6.5 million + freeze fees to settle retirement plan lawsuit. Unreasonable fees led to costly settlement. Too bad thet did not have a Certification of Reasonableness! Yahoo references DALBAR's QAIB in report of “5 things I Wish I Knew in My 20s”… (1) Time is your most valuable asset, (2) Investing in penny stocks doesn't usually work out well, (3) Buy-and-hold is the way to go, (4) Don't have a herd mentality, (5) The "automatic" 401(k) contribution rate is by no means enough. The necessary cyber security depends on the cyber services provided… new worksheet shows if your security is adequate. Study shows maximum reasonable cost at $1,764,000 (176 bps) for $100 million plan with high contribution levels, well balanced investments, great service.